ErinNichols.Net – My Musings on Games, E-Learning, and Other Excellent (Sort Of) Educational Things…. My Musings on Games, E-Learning, and Other Excellent (Sort Of) Educational Things…. Last Friday I watched a webinar that gave an overview of the features in Storyline 2. Don’t worry. You didn’t miss out on a once-in-a-lifetime opportunity or anything — they have them every Monday, Wednesday, and Friday. Anyway, I’ve always wanted to try this software. People make cool looking projects with it, but it sounded really intimidating and time consuming. Eek! Scary! However, after I sat through the tour I really wanted to give the program a test drive. I figured that the best way to do this would be to work backwards (in a sense) by using a template that someone else had already created. I found a cute quiz with a dinging bell and an attractive “pathway to victory” and proceeded to make a test about my cat. Yup. I’m that person. So I made it extremely purple, added a silly blonde cartoon character (me, obviously haha), and many, many images of my cat. But perhaps in version 2 I’ll have that all figured out? Thankfully, Storyline has a similar interface to Camtasia. The most obvious being that you can quickly manipulate, edit, drag, and drop each of a slide’s individual items (text, pictures, actions, sounds etc…) on a timeline. I think I’ll be able to get the hang of it. That chiming bell should probably be replaced with a meow too, right? So, without further adieu, would you like to prove whether or not you know the ins and outs of Watson? I haven’t noticed very many people talking about using Blackboard’s Achievements tool (but everyone is certainly all abuzz about badges and gamification) so when my office upgraded our LMS and this option became available I wanted to give it a whirl. 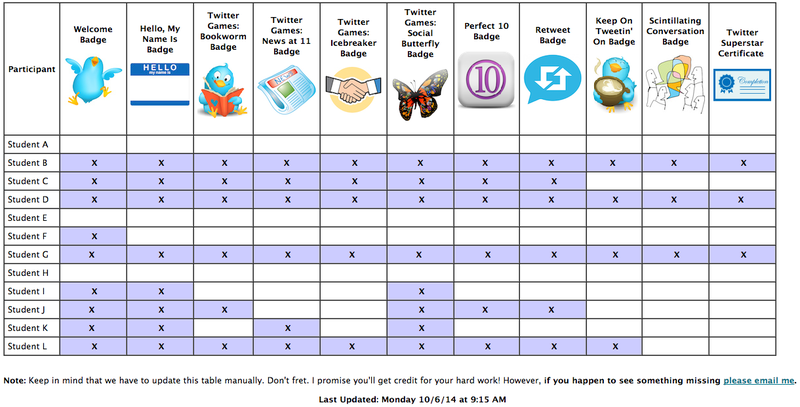 I ended up using it in a 2-week professional development setting for a class on Twitter as a PLN. As the seminar I was teaching mainly involved the students completing tasks on their own Twitter accounts I ended up having to figure out a way to award achievements for items I had to review manually. To do this I set-up a number of specifically titled individual grade center columns and tied the score entered in the column to the awarding of an achievement. 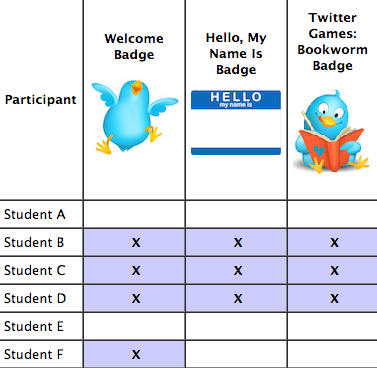 So, for example, if Jane successfully tweeted using the class hashtag I’d enter 100 in the grade center column titled “Hashtag” and Jane would receive a new accomplishment badge. One aspect of the tool that I simply don’t understand at all is the lack of a leaderboard. As far as I can tell there’s no way to visually show all students where they stand regarding which badges or achievements they’ve completed. In my opinion one of the best parts about gamification is a little friendly competition. To bring that environment into the seminar I ended up creating a table that I manually updated daily as the students obtained their badges. They could then see how they were coming along in comparison to their peers. Admittedly this was a rather time consuming undertaking but for me it seemed like a necessity. Of course, I probably didn’t have to color in each completed task cell with a lavender background but I REALLY wanted to. I’ve attached the completed leaderboard so you can see what it ended up looking like with the students names removed (of course). 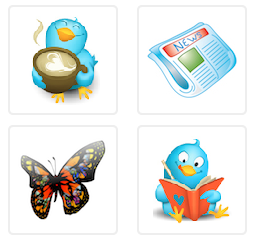 The badges that come with Blackboard are pretty bland but you can create your own. Just keep the image dimensions to around 90 pixels in width or below and you should be all set. Here’s a quick tour of the course shell from the student’s perspective and some of the activities one might arrange in order for achievements to automatically appear when a task is completed. Frankly, I’m still deciding whether or not I found this tool useful beyond the fact that it amused me so I’ll write a bit more about that at a later time. I definitely think I need to have another opportunity to test it with students again before fully committing one way or another. I’m horrible at watching scary movies and television shows but that doesn’t really stop me from still needing to see some of them. The line I draw between what I will willingly sit through (mostly with hands covering my eyes) and those I have to read plot summaries of on Wikipedia is a bit blurry. For example, the new TV show The Strain is vile (what is up with those spring loaded tentacles?!) and scares the heck out of me but I’m obsessed with it and watch it every single week. That may also have something to do with Corey Stoll (I can’t wait until he loses that awful wig) but I digress… On the other hand, I refuse to ever watch any of the Saw films — although I know what happens because I read all about them. I also tend to read the synopsis for movies like The Purge (sorry Ethan Hawke) and while I sat through the first Paranormal Activity in the Theater I skipped the rest in favor of — you guessed it — getting the 3 paragraph rundown online. Another show I love is The Walking Dead. Zombies! Yay! It’s also gory and peppered with silly jump scares that I gullibly fall for every single time, but I keep watching and now I’m not only watching but playing the game. During a recent Steam sale I picked up the Walking Dead game for just a few dollars and I played it for the first time over the weekend. I’m happy to report that when you totally blow it, can’t figure out the game controls, and your brains get eaten by zombies it simply restarts the scenario you’re in and lets you give it another go. This is a relief because I’m sort of hopeless when it comes to playing a video game for the first time. This is probably compounded by the fact that for years I’ve really only played World of Warcraft and, let’s be honest, not that well. So each new game that I try entails me flailing about and fumbling with the keyboard for a good hour before I can make heads or tails of anything. I also have this thing where I apparently can’t figure out how to open doors. I seriously couldn’t get inside a sliding glass door for like 35 minutes. The character I was playing just kept saying, “I wonder if anybody’s home?” over and over and over again until I wanted a zombie to eat him. Finally I had to google it and find a video. It was a little less embarrassing realizing that it seemed to be a common problem for players, but since the same thing happened to me while trying to get into the Gone Home house I’m starting to get a bit of a complex. Plus, I don’t really want to “cheat” and look up things every time I run into a snag in a game. Google is like the 2014 version of the Game Genie. Sure I beat lots of games with that silly add-on back in 1991 but in truth the only 2 video games I ever completed all on my own were the NES version of Paper Boy (OK…admittedly I’m kind of proud of this one) and Toe Jam and Earl: Panic on Funcotron for Sega. Anyway, eventually I did get inside the house and things picked up a bit more. 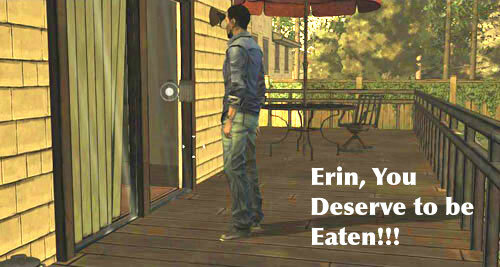 What I enjoy about games like The Walking Dead are the choose your own adventure style of narrative. This game, much more so than The Novelist, really pivots your storyline and progression dramatically depending upon the choices you make and the interactions you have with a myriad of characters. I’m not very far in but I’m intrigued. The storyline is wonderfully paced, unique, and engaging. I was honestly a bit worried about the gore/horror factor but since the graphics are done in a comic book style I’m pretty desensitized to it. I mean…the Oculus trailer is scarier than anything I’ve experienced in this game so far and let’s hope it stays that way because I’d much rather immerse myself in the psychology of the storyline than guts and blood. But let’s be honest, I can’t help but wonder…what are the REALLY super scary games? The ones I probably should read about on Wikipedia and not play late at night in a dimly lit office. There’s a long weekend coming up. Any suggestions? 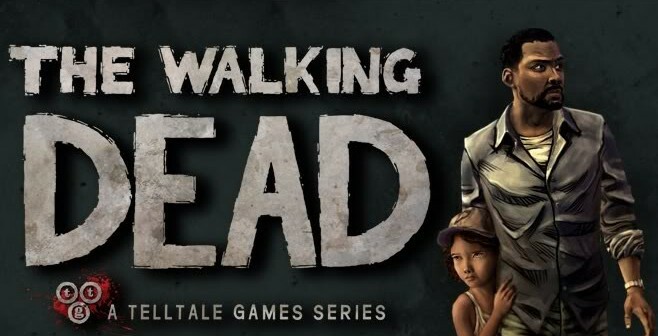 PS: As of August 27, 2014 The Walking Dead Season 2 game is on sale for $9.99 and Season 1 is only $6.24. After playing Gone Home (a game that I think is the most brilliant thing since sliced bread and encourage you to buy it immediately) I fell into the indie game rabbit hole on Steam and was really taken with the trailer (linked above) for The Novelist. Watch it. It’s kind of creepy, right? I ended up playing through the game for the first time last week. The gameplay itself is incredibly simple and easy to pick up. I was a bit disappointed in the lack of total functionality of the beach house itself, but I think I got a little spoiled in Gone Home due to the fact that you could pretty much touch, open, turn off and on, and literally chuck almost anything on the floor in that particular game’s house. Regardless, this game isn’t about graphics. This game is about choices and how your choices shape not only your future but the also the lives of those who love you. I find it difficult to discuss the game in too much depth because I don’t want to spoil the general storyline, but I will admit that the longer I played the more time it took for me to weigh the needs and wants of each of the 3 family members. You’re only allowed to choose one person’s “request” in each scenario so 2 people are always disappointed. You do have the option of selecting a second family member’s request to be “granted” in a compromise but they don’t generally end up being very happy about that. That being said I hope to go through the game another time and see how much of the storyline actually changes when different choice combinations are made. I also wonder at the plausibility of this game being used in a classroom? Are there any psychology teachers out there? What do you think? I have a hunch that using this game in a well-structured activity would generate quite a bit of chatter or at the very least reveal a little bit about yourself. After all, as many other reviewers have noted, you’re the omniscient entity puppeteering the Kaplans and there’s no way (if you’re taking it seriously) that experiences in your own life aren’t steering you toward certain decisions in the game. That warrants a journal entry or two, right? There are some very interesting articles about The Novelist and even a number of walkthroughs posted on YouTube but I strongly encourage you to play the game in order to get the full effect. Have you played? What did you think? I adore my Kindle and read fiction as much and as often as I possibly can on it. However, when it comes to retaining unfamiliar information, especially educational articles or books on topics I really want to learn (and actually be able to explain to someone else) I find that I have to go the “old fashioned” route and either purchase a physical version or print out a hard copy. There are articles citing studies that note contradicting points of view on this subject. 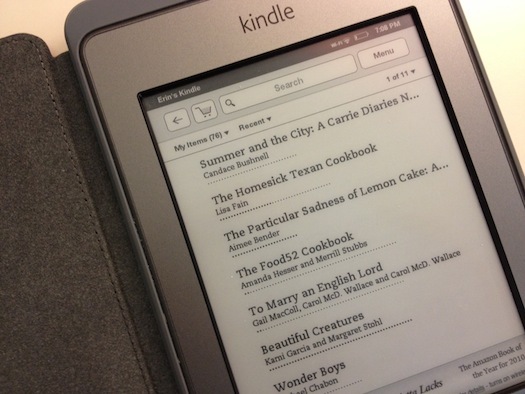 Some say your retention rates are the same, some say eBooks aren’t cutting it. In the end I feel that it really just ends up being your personal preference. I need my pink highlighter in hand and you might be just fine with touch highlighting all of your favorite quotes in an eReader. Where am I going with this and what does it have to do with Blackboard and printing? Well, when I first began working in my current position we manually created and embedded PDF files of weekly course content for our online students. They found this very helpful. In addition, the process for our staff was simple and straightforward, but when we upgraded to Blackboard 9 the trusty File+Print+Save to PDF trick just wouldn’t work. The page view was hopelessly truncated. At this time many instructors also began to use the learning module feature for their online courses which makes it impossible for students to print a linear document of their assignments on their own at all. Which is one of the MANY reasons why I prefer the use of weekly folders of content over learning modules but that’s a rant for a different day. So I fumbled around and googled and couldn’t find anything helpful. It sort of felt like the LMS was forcing you to only access your content on your computer, but guess what, a huge segment of the population needs to be able to print reading material. Eventually I discovered that if I right-clicked on content folders or modules and had them open in new windows I could once again create full printable versions of a course’s content. Also interesting is that, for some reason, I’ve only ever been able to get this to work in Chrome. If you’d like to walk through the steps I use to make Blackboard printables you can view this downloadable tutorial. It looks daunting at first but I promise that after you make a handful of PDFs you’ll be able to complete the action in seconds. In addition, here’s an example of how the printable might appear for you. Note: Any large blank spaces are embedded YouTube Videos that do not appear to translate as an image onto the PDF. And yes, that’s a week of course content I came up with for one of my graduate classes dealing with A Christmas Carol. No laughing! 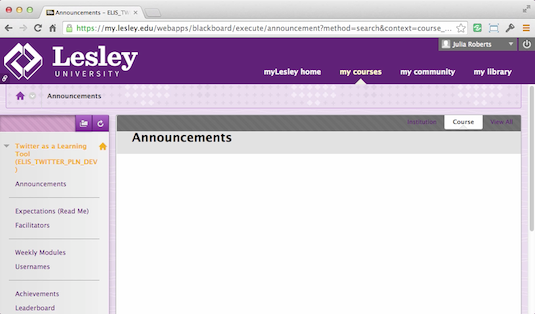 I’d love to know if anyone has been able to print content in Blackboard 9 (and up) in another (hopefully more simple) manner. If so, definitely let me know! I thought that in this case I’d actually keep the default WordPress initial post title of “Hello World” as it seemed rather fitting as I’ll be writing on here about topics that are vastly different than those found on my other blogs. There will be no mojito cakes or Top 11 (so random, Erin…) Christmas Special items in this new space. Instead I hope to touch upon and highlight some of the interests that I encounter in my professional realm of e-Learning, online education, and instructional design. I’ll also share tutorials I’ve created, articles and other readings of interest, and undoubtedly a plethora of posts detailing my quest to get a handle on the use of games in the classroom. I’m so serious about the gaming part of this project that I even built my own PC (with a little help) devoted to gaming — much to the horror of every Apple device in my house. I’m going to make something gorgeous and educationally relevant in Minecraft if it kills me. However, first I have to stop typing and referring to the game as “Mindcraft…” Anyway, welcome! I hope you find the content I post useful.